I eat a fish which is dried. (Before we eat dried fish, we grilled them.) But you might not know which is a dried fish on a dish. People living 50 years ago, who didin't live near the sea, ate dried fish. That's interesting. I've never had dried fish or "stockfish". Maybe someday I'll get the chance to try it. The only exposure to Japanese food is through "Iron Chef". Lucy - That breakfast looks very good and healthy. The only thing missing for me would be coffee. I have to have that morning JOLT. What's that little salad bowl filled with? The photo is good. I also love to make photos of dishes I eat. You have busy week. Take care!! 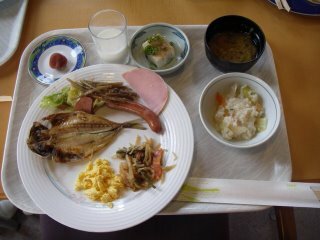 After this breakfast, we had a cup of coffee. Some day I try to post about “TOFU”. Oh, tofu. I know what that is, thanks. Or at least the thing that is sold by the name tofu over here. Japanese people must be making it good, cause the one we have here is, pardon me, horrible. Lucy - I think you're right - JOLT may be a cola but I was just using it as an expression for how I feel after I've had my coffee...it's like a jolt of electricity in my system. Now you have me curious to see what the cola JOLT is like. You know Tofu!! Saz knows gree tea ice. I think Japanease food is famous in the world now. My husband said we bought JOLT coke in Japan. But I didn't know. And we can't buy it now in Japan.